The Planning Committee on Connector Reliability for Offshore Oil and Natural Gas Operations held the Workshop on Bolting Reliability for Offshore Oil and Natural Gas Operations in Washington, D.C., on April 10-11, 2017. The workshop was designed to advance and develop a comprehensive awareness of the outstanding issues associated with fastener material failures and equipment reliability issues. Speakers and participants were also encouraged to discuss possible paths for ameliorating risks associated with fasteners used for subsea critical equipment in oil and gas operations. This publication summarizes the presentations and discussions from the workshop. In January 2003, President George W. Bush announced that the United States would begin negotiations to join the ITER project and noted that “if successful, ITER would create the first fusion device capable of producing thermal energy comparable to the output of a power plant, making commercially viable fusion power available as soon as 2050.” This interim report assesses the current status of U.S. fusion research and of the importance of burning plasma research to the development of fusion energy as well as to plasma science and other science and engineering disciplines. The final report will present strategies that incorporate continued progress toward a burning plasma experiment and a focus on innovation. TRB's Special Report 325: Safely Transporting Hazardous Liquids and Gases in a Changing U.S. Energy Landscape reviews how the pipeline, rail, and barge industries have fared in safely transporting the increased volumes of domestically produced energy liquids and gases. The report, sponsored by TRB, reviews the safety record of the three transportation modes in moving these hazardous shipments and discusses key aspects of each mode’s safety assurance system. Accompanying the report is a two-page document highlighting the report's findings and recommendations. This report is currently in prepublication format and available online only. The Superfund program of the US Environmental Protection Agency (EPA) was created in the 1980s to address human-health and environmental risks posed by abandoned or uncontrolled hazardous-waste sites. Identification of Superfund sites and their remediation is an expensive multistep process. As part of this process, EPA attempts to identify parties that are responsible for the contamination and thus financially responsible for remediation. This report examines the extent to which various sources contribute to environmental lead contamination at Superfund sites that are near lead-mining areas and focuses on sources that contribute to lead contamination at sites near the Southeast Missouri Lead Mining District. It recommends potential improvements in approaches used for assessing sources of lead contamination at or near Superfund sites. Americans' safety, productivity, comfort, and convenience depend on the reliable supply for electric power. The electric power system is a complex "cyber-physical" system composed of a network of millions of components spread out across the continent. This report focuses on identifying, developing, and implementing strategies to increase the power system's resilience in the fact of events that can cause large-area, long-duration outages: blackouts that extend over multiple service areas and last several days or longer. In 2005, the National Research Council report Rising Above the Gathering Storm recommended a new way for the federal government to spur technological breakthroughs in the energy sector. It recommended the creation of a new agency, the Advances Research Projects Agency-Energy (ARPA-E), as an adaptation of the Defense Advances Research Projects Agency (DARPA) model, This report appraises the appropriateness and effectiveness of ARPA-E's processes and operations to achieve its missions and goals. The study's committee of experts relied on quantitative and qualitative analyses to develop a set of findings and recommendations to the agency and to Congress. This Transportation Research Board's (TRB's) National Cooperative Highway Research Program (NCHRP) Research Report describes policy, planning, design, and operations practices considering the coexistence of moving goofs and services in smart growth environments at both the design and implementation stages as well as retroactively improving existing conditions. The report analyzes common issues and conflicts manifest themselves in different environments, and the types of strategies and actions stakeholders can take to better integrate goods and services movement by commercial vehicles in smart growth. Since the publication of the 2013 National Research Council report, Assessment of Advances Solid-State Lighting, the penetration of solid-state lighting (SSL) has increased dramatically, with a resulting savings in energy and costs that were foreshadowed by that study. This phase two report highlights the progress of commercialization and acceptance of SSL and review the technical advances and challenges in achieving higher efficacy for light-emitting diodes (LEDs) and organic light-emitting diodes. This publication summarizes a symposium held June 16-17, 2016 in Brussels, Belgium. The two-day symposium brought together high-level experts to share their views on disruptions to the transportation system resulting from climate change and extreme weather events. With the goal of fostering trans-Atlantic collaboration in research and deployment, symposium participants discussed the technical, financial, and policy challenges to better plan, design, and operate the transportation network before, during, and after extreme and/or long-term climate events. Transportation Research Board's Transportation Research E-Circular 213 documents the papers and discussions from a conference that took place on November 15-17, 2015 in Minneapolis, Minnesota. The conference focused on how investments in light rail and streetcars may strengthen the entire transit network, contribute to regional mobility, and integrate successfully into the built environment. The conference included case studies showcasing the application of light rail and streetcars in metropolitan areas. Electricity, supplies reliably and affordably, is foundational to the U.S. economy and is utterly indispensable to modern society. However, emissions resulting from many forms of electricity generation create environmental risks that could have significant negative economic, security, and human health consequences. This report considers how to speed up innovation that would dramatically improve the performance and lower the cost of currently available technologies while also developing new advances cleaner energy technologies. 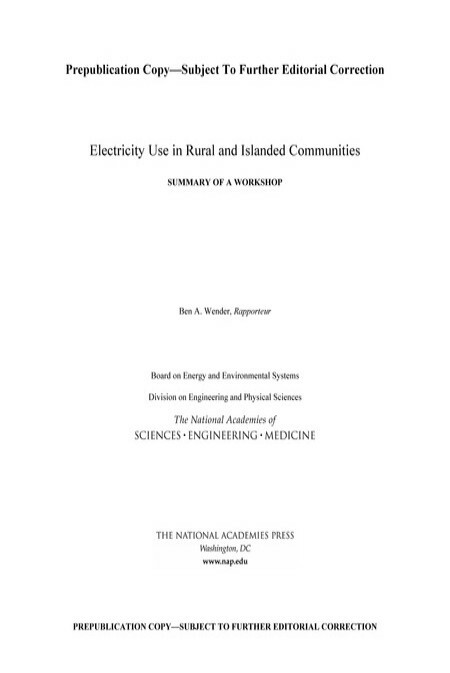 On behalf of the Quadrennial Energy Review (QER) Task Force, the Academies a workshop on February 8-9, 2016, titled "Electricity Use in Rural and Islanded Communities." The objective of the workshop was to help the QER Task Force public outreach efforts by focusing on communities with unique electricity challenges. The workshop explored challenges and opportunities for reducing electricity use and associated greenhouse gas emissions while improving electricity system reliability and resilience in rural and islanded communities. This report summarizes the presentation and discussion of the workshop. The U.S. Congress asked the Academies to conduct a technical study on lessons learned from the Fukushima Daiichi nuclear accident for improving safety and security of commercial nuclear power plants in the United States. 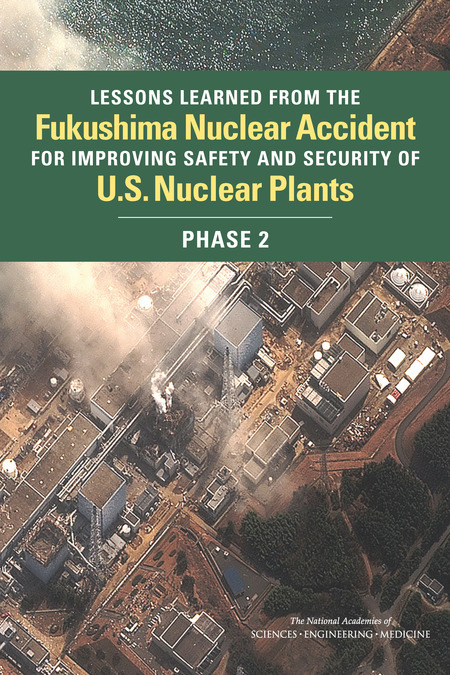 This study was carried out in two phases: Phase 1, issued in 2014, focused on the causes of the Fukushima Daiichi accident and safety-related lessons learned for improving nuclear plant systems, operations, and regulations exclusive of spent fuel storage. This Phase 2 report focuses on three issues: (1) lessons learned from the accident for nuclear plant security, (2) lessons learned for spent fuel storage, and (3) reevaluation of conclusions from previous Academies studies on spent fuel storage. Electricity is the lifeblood of modern society, and for the vast majority of people that electricity is obtained from large, interconnected power grids. However, the grid that was developed in the 20th century, and the incremental improvements made since then, including its underlying analytic foundations, is no longer adequate to completely meet the needs of the 21st century. The next-generation electric grid must be more flexible and resilient. 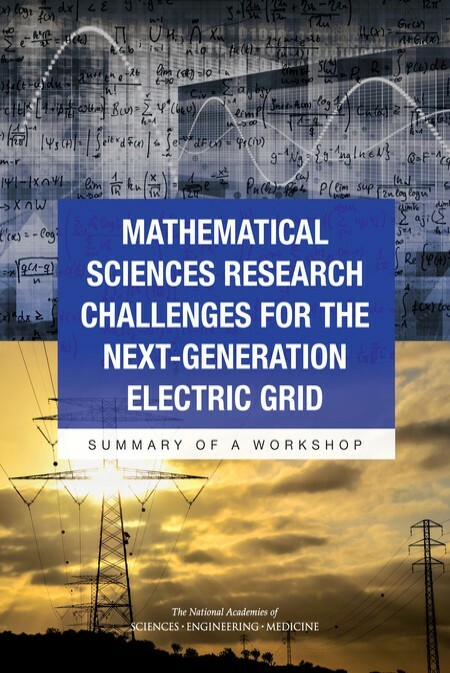 This report provides guidance on the longer-term critical areas for research in mathematical and computational sciences that is needed for the next-generation grid. It offers recommendations that are designed to help direct future research as the grid evolves and to give the nation’s research and development infrastructure the tools it needs to effectively develop, test, and use this research. If the United States is to sustain its economic prosperity, quality of life, and global competitiveness, it must continue to have an abundance of secure, reliable, and affordable energy resources. There have been many improvements in the technology and capability of the electric grid over the past several decades. Many of these advances to the grid depend on complex mathematical algorithms and techniques, and as the complexity of the grid has increased, the analytical demands have also increased. 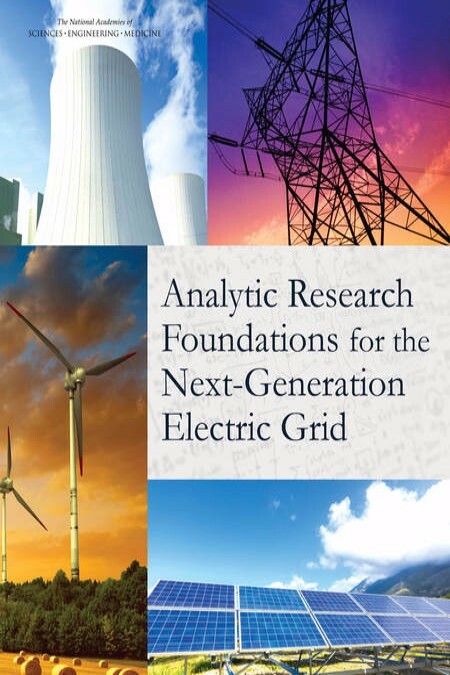 The workshop summarized in this report was developed as part of an ongoing study of the Committee on Analytical Research Foundations for the Next-Generation Electric Grid and held on February 11-12, 2015. As the fourth and final session of the Roundtable on Science and Technology for Sustainability’s 2013-2014 initiative to examine the energy-water nexus, the December 2014 meeting featured panel discussions on improved data for water use, decision support tools, and frameworks for local and regional decision making. The panel was convened in collaboration with the Board on Energy and Environmental Systems (BEES) and the Water Science and Technology Board (WSTB). This Meeting in Brief synthesizes the discussions held during the event. The plug-in electric vehicle (PEV) holds much promise today—from reducing dependency on imported petroleum to decreasing greenhouse gas emissions to improving urban air quality. At the request of Congress, this report identifies barriers to the introduction of electric vehicles and recommends ways to mitigate these barriers. The report examines the characteristics and capabilities of electric vehicle technologies, such as cost, performance, range, safety, and durability, and assesses how these factors might create barriers to widespread deployment. This report summarizes the presentations and discussions of the May 2014 Gilbert W. Beebe Symposium, co-hosted by the National Academy of Sciences and the National Cancer Institute. 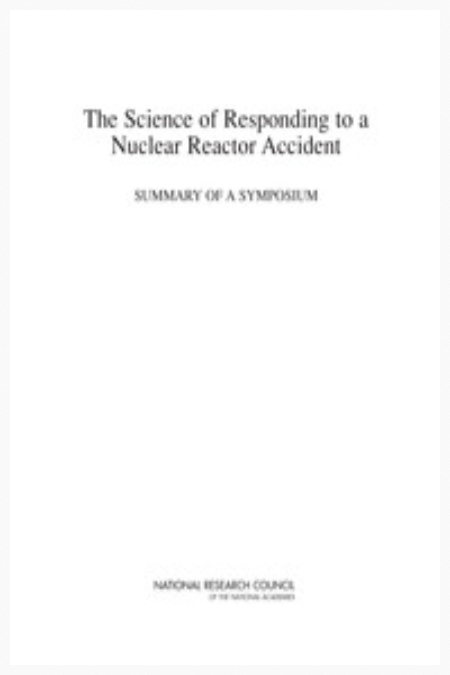 The report addresses off-site emergency response and long-term management of the accident consequences; estimating radiation exposures of affected populations; health effects and population monitoring; other radiological consequences; and communication among plant officials, government officials, and the public and the role of the media. 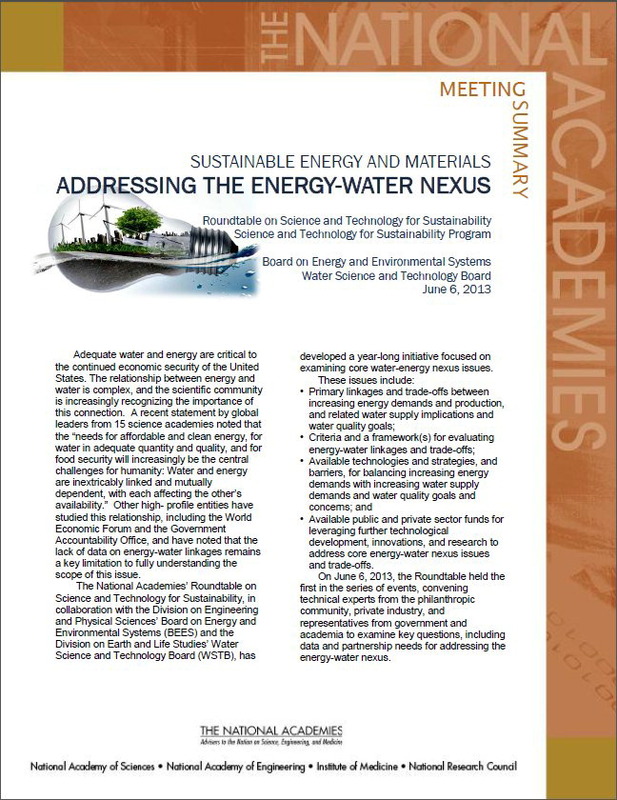 In May 2014, the Roundtable on Science and Technology for Sustainability convened a panel to examine technological innovation to address the energy-water nexus. 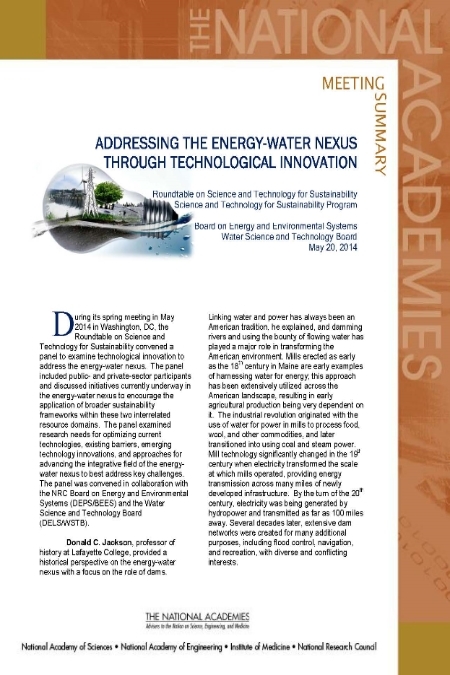 The panel examined research needs for optimizing current technologies, existing barriers, emerging technology innovations, and approaches for advancing the integrative field of the energy-water nexus to best address key challenges. The panel was convened in collaboration with the Board on Energy and Environmental Systems (BEES) and the Water Science and Technology Board (WSTB). This meeting summary synthesizes the discussions held during the event. 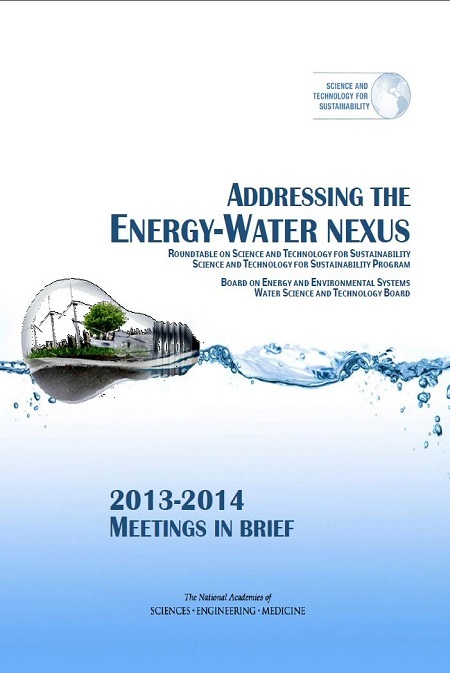 The National Academies' Roundtable on Science and Technology for Sustainability met on December 5, 2013, to examine issues related to the energy-water nexus. 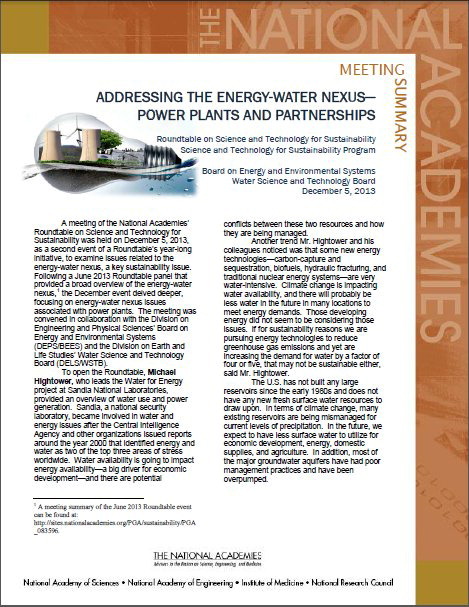 Following a June 2013 Roundtable panel that provided a broad overview of the energy-water nexus, the December event delved deeper, focusing on energy-water nexus issues associated with power plants. The meeting was convened in collaboration with the Board on Energy and Environmental Systems (BEES) and the Water Science and Technology Board (WSTB). This summary synthesizes the discussions held during the event. 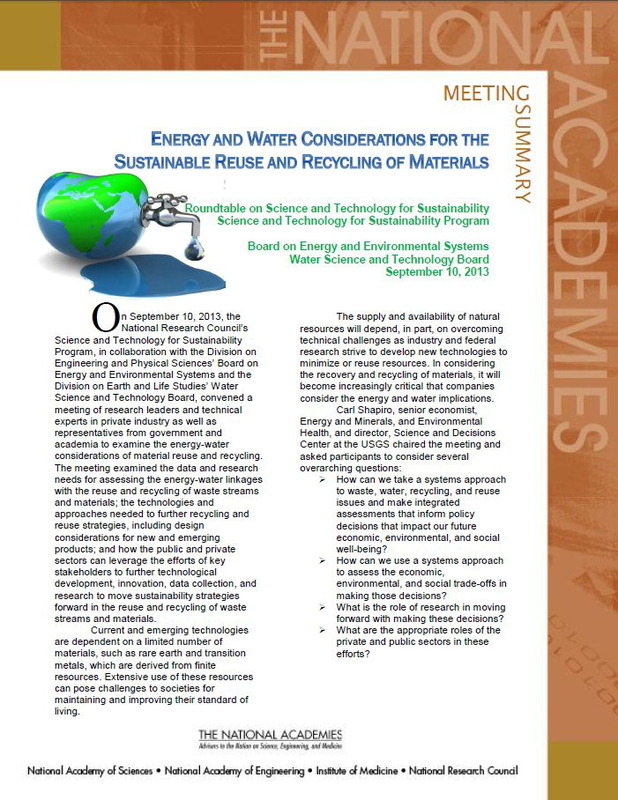 In September 2013, the STS Program convened a meeting of research leaders and technical experts in private industry as well as representatives from government and academia to examine the energy-water considerations of material reuse and recycling. The meeting examined the data and research needs for assessing the energy-water linkages with the reuse and recycling of waste streams and materials; the technologies and approaches needed to further recycling and reuse strategies; and how the public and private sectors can leverage the efforts of key stakeholders to further technological development, innovation, data collection, and research. This meeting summary synthesizes the discussions held during the event. Natural gas in deep shale formations, which can be developed by hydraulic fracturing and associated technologies (often collectively referred to as "fracking") is dramatically increasing production of natural gas in the United States, where significant gas deposits exist in formations that underlie many states. 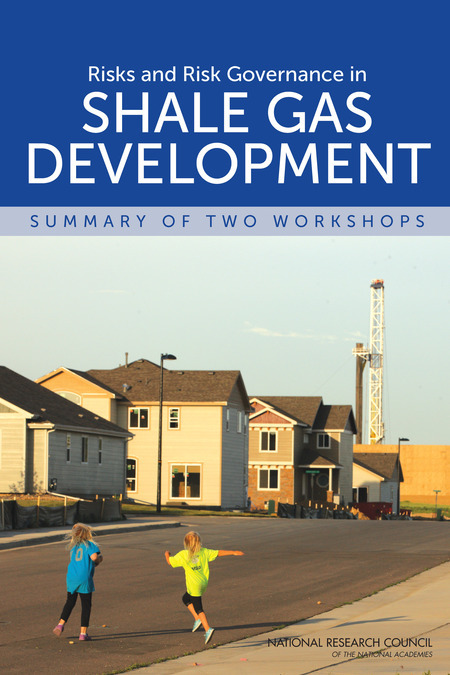 This report is the summary of two workshops convened in May and August 2013 to consider and assess claims about the levels and types of risk posed by shale gas development and about the adequacy of existing governance procedures. Central themes included risk governance in the context of (a) risks that emerge as shale gas development expands, and (b) incomplete or declining regulatory capacity in an era of budgetary stringency. A new congressionally mandated report from the National Academy of Sciences examines the causes of the accident at the Fukushima Daiichi nuclear plant initiated by the March 11, 2011 Great East Japan Earthquake and tsunami and identifies lessons learned for improving nuclear plant safety and offsite emergency responses to nuclear plant accidents in the United States. The overarching lesson learned is that nuclear plant licensees and their regulators must actively seek out and act on new information about hazards that have the potential to affect the safety of nuclear plants. The National Academies Keck Futures Initiative (NAKFI) Conference in 2013 focused on the Future of Advanced Nuclear Technologies to generate new ideas about how to move nuclear technology forward while making the world safer and more secure. Beyond the public's apprehension concerning the safety of nuclear power, which calls out for better communications strategies, several challenges lie ahead for the nuclear enterprise in the United States. This report summarizes the 14 Interdisciplinary Research (IDR) teams' collaborations on creative solutions to challenges designed to propel the policy, engineering, and social aspects of the nuclear enterprise forward. Medium- and heavy-duty trucks, motor coaches, and transit buses - collectively, "medium- and heavy-duty vehicles", or MHDVs - are used in every sector of the economy. The fuel consumption and greenhouse gas emissions of MHDVs have become a focus of legislative and regulatory action in the past few years. The report reviews fuel consumption regulations and considers the technological, market and regulatory factors that may be of relevance to a revised and updated regulatory regime taking effect for model years 2019-2022. The Transportation Research Board's Conference Proceedings on the Web 14: Sustainable Energy and Transportation Strategies, Research, and Data includes summaries of plenary session presentations that were made during a November 2012 conference in Washington, D.C. The conference explored potential research needed to further advance the development of alternatives to petroleum-based transportation and to lower greenhouse gas emissions. Shale gas is the fastest growing source of U.S. natural gas. Most of the oil and gas produced in the United States comes from conventional reservoirs in which hydrocarbons have accumulated in discrete structural or stratigraphic traps below relatively impermeable rock and above a well-defined hydrocarbon-water interface. However, a growing fraction comes from unconventional reservoirs - geographically extensive accumulations of hydrocarbons held in low-permeability rock with diffuse boundaries and no obvious traps or hydrocarbon-water contacts. This report examines the potential effects on surface water and groundwater quality and quantity; potential effects on landscapes, including soil and living organisms, and other environmental systems; and technical and engineering processes for exploration and production. This report summarizes a workshop convened in February 2013 as a follow-up to the release of the National Research Council report, Terrorism and the Electric Power Delivery System. The workshop focused on five key areas: physical vulnerabilities of the grid; cyber security; mitigation and response to outages; community resilience and the provision of critical services; and future technologies and policies that could enhance the resilience of the electric power delivery system. As the first event of a year-long initiative, a session was held at the June 2013 Roundtable on Science and Technology for Sustainability meeting in collaboration with the Board on Energy and Environmental Systems (BEES) and the Water Science and Technology Board (WSTB). The session featured panel discussions focused on addressing issues related to the energy-water nexus, a key sustainability issue, as adequate water and energy are critical to the continued economic security of the United States. 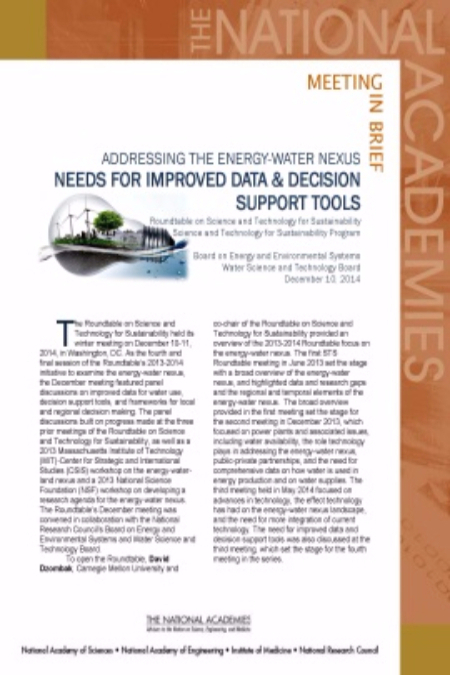 The event examined key questions, including data and partnerships needs for addressing the energy-water nexus. This report follows on three previous NRC reviews of the FreedomCAR and Fuel Partnership, which was the predecessor of the U.S. DRIVE Partnership (NRC, 2005, 2008a, 2010). The U.S. DRIVE (Driving Research and Innovation for Vehicle Efficiency and Energy Sustainability) vision, according to the charter of the Partnership, is this: American consumers have a broad range of affordable personal transportation choices that reduce petroleum consumption and significantly reduce harmful emissions from the transportation sector. Its mission is as follows: accelerate the development of pre-competitive and innovative technologies to enable a full range of efficient and clean advanced light-duty vehicles (LDVs), as well as related energy infrastructure. The Partnership focuses on precompetitive research and development (R&D) that can help to accelerate the emergence of advanced technologies to be commercialization-feasible. Biofuels made from algae are gaining attention as a domestic source of renewable fuel. However, with current technologies, scaling up production of algal biofuels to meet even 5 percent of U.S. transportation fuel needs could create unsustainable demands for energy, water, and nutrient resources. Continued research and development could yield innovations to address these challenges, but determining if algal biofuel is a viable fuel alternative will involve comparing the environmental, economic and social impacts of algal biofuel production and use to those associated with petroleum-based fuels and other fuel sources. As the largest global consumer of energy and of many materials used in traditional and advanced technologies, there is an increased recognition among US federal agencies and the corporate sector of the need to identify and develop sustainable sources of energy and materials. This is evidenced by the increase in funding for research and development in this area in both sectors. The June meeting of the Roundtable on Science and Technology for Sustainability included a session that provided an overview of the landscape of efforts underway on sustainable energy and materials, such as identifying any key policy, research, and technological gaps. Presentations during the session addressed the future of nuclear and wind energy; the evolution of energy systems; and material constraints of energy technologies. In the past several years, some energy technologies that inject or extract fluid from the Earth, such as oil and gas development and geothermal energy development, have been found or suspected to cause seismic events, drawing heightened public attention. Although only a very small fraction of injection and extraction activities among the hundreds of thousands of energy development sites in the United States have induced seismicity at levels noticeable to the public, understanding the potential for inducing felt seismic events and for limiting their occurrence and impacts is desirable for state and federal agencies, industry, and the public at large. 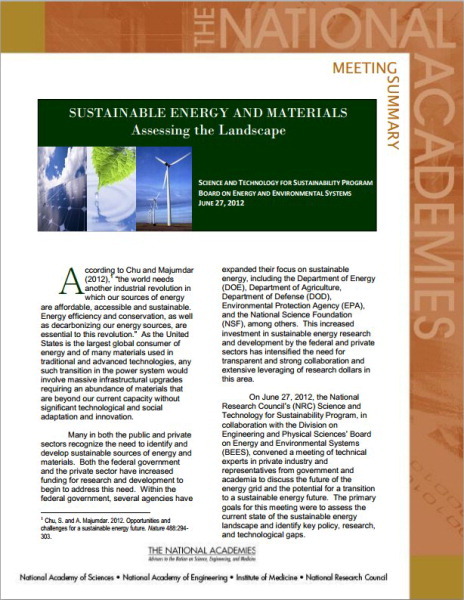 This report identifies gaps in knowledge and research needed to advance the understanding of induced seismicity; identify gaps in induced seismic hazard assessment methodologies and the research to close those gaps; and assess options for steps toward best practices with regard to energy development and induced seismicity potential. In the United States, we have come to depend upon plentiful and inexpensive energy to support our economy and lifestyles. In recent years, many questions have been raised regarding the sustainability of our current pattern of high consumption of nonrenewable energy and its environmental consequences. This report evaluates the economic and environmental consequences of increasing biofuels production as a result of Renewable Fuels Standard, as amended by EISA (RFS2). The report describes biofuels produced in 2010 and those projected to be produced and consumed by 2022, reviews model projections and other estimates of the relative impact on the prices of land, and discusses the potential environmental harm and benefits of biofuels production and the barriers to achieving the RFS2 consumption mandate. TRB Special Report 305: Structural Integrity of Offshore Wind Turbines. Oversight of Design, Fabrication, and Installation explores the U.S. Department of Interior's Bureau of Ocean Energy Management, Regulation and Enforcement (BOEMRE) approach to overseeing the development and safe operation of wind turbines on the outer continental shelf, with a focus on structural safety. The committee that developed the report recommended that in order to facilitate the orderly development of offshore wind energy and support the stable economic development of this nascent industry, the United States needs a set of clear requirements that can accommodate design development. Various combinations of commercially available technologies could greatly reduce fuel consumption in passenger cars, sport-utility vehicles, minivans, and other light-duty vehicles without compromising vehicle performance or safety. This book estimates the potential fuel savings and costs to consumers of available technology combinations for three types of engines: spark-ignition gasoline, compression-ignition diesel, and hybrid. The book focuses on fuel consumption--the amount of fuel consumed in a given driving distance--because energy savings are directly related to the amount of fuel used. In contrast, fuel economy measures how far a vehicle will travel with a gallon of fuel. Because fuel consumption data indicate money saved on fuel purchases and reductions in carbon dioxide emissions, the book finds that vehicle stickers should provide consumers with fuel consumption data in addition to fuel economy information.